Under the anaerobic (oxygen free) conditions of landfill sites, organic waste is broken down by micro-organisms, leading to the formation of landfill gas (LFG). LFG is a gaseous mixture which consists mostly of methane and carbon dioxide, but also of a small amount of hydrogen and occasionally trace levels of hydrogen sulphide. LFG capture projects aim at preventing the emissions of gases (both methane and other pollutants) from landfills. The basic idea is that the landfills are covered (e.g. by a layer of earth) and that the gases are collected through wells and pipeline systems. The methane thus recovered can either be flared, or used for electricity generation. Under the anaerobic (oxygen free) conditions of landfill sites, organic waste is broken down by micro-organisms, leading to the formation of landfill gas (LFG). LFG is a gaseous mixture which consists mostly of methane and carbon dioxide, but also of a small amount of hydrogen and occasionally trace levels of hydrogen sulphide. LFG capture projects aim at preventing the emissions of methane and other pollutants from landfills. The basic idea behind the technology is that the landfills are covered (e.g. by a layer of earth) and that LFG is extracted from landfills using a series of wells and a blower/flare (or vacuum) system. This system directs the collected gas to a central point where it can be processed and treated depending upon the ultimate use of the gas. From this point, the gas can be simply flared (thereby converting methane into CO2) or used to generate electricity and/or heat, replace fossil fuels in industrial and manufacturing operations, or fuel greenhouse operations. The gas could also be upgraded (purified) to natural gas standards. A wide variety of gas wells and collection systems are available. The choice will depend to some extent on site-specific factors, such as depth of waste and water table. The choice of the engine depends on many factors, including the gas generation rate and its composition, the plant efficiency, plant availability, necessary gas pretreatment, maintenance requirements, operator’s familiarity with the plant, plant flexibility and life expectancy, and cost. The gas yield will depend on the nature of the landfill. For a large modern landfill, useable LFG may be generated for between 15 and 30 years. lack of legislation: Although countries usually have in place legislation on reduction of the harmful impact of waste and environment conservation, in many developing countries legislation enforcing landfill gas extraction with or without utilization is absent. unfavourable financial performance: As shown by several CDM projects in the field of LFG capture and use (see cdm.unfccc.int), the financial performance of such projects is generally insufficient to attract enough investment funding from financial institutes (i.e. the project is unattractive compared to the interest rates provided by local banks). In the case of the CDM, projects are financially supported through the sale of carbon credits based on the avoidance of methane emissions. Generally, waste management is driven by municipalities with little or no private sector involvement: With waste taxes being too low, municipalities generate insufficient income for waste management in an environmentally friendly way. From the CDM LFC capture project pipeline (see for an example of a CDM project in Bangladesh: http://cdm.unfccc.int/UserManagement/FileStorage/FS_334865036) it can also be concluded that lack of technology know-how and lack of availability of equipment are important barriers. There could be a lack of social acceptability, for example, when landfills are a source of live for nearby communities. There is also the institutional aspect of waste not systematically being collected in several areas in developing countries. promotion of recycling (US EPA, 2003). In industrialised countries, the development of the LFG capture and combustion technology has reached the status of deployment of the technology into the market. Activities are focussed on developing the technology to a level of commercial application by making technical improvements and reducing costs. For example, the US Landfill Methane Outreach Program (LMOP) promotes LFG as an important local energy resource by informing local governments and communities about the benefits of LFG recovery and by building partnerships between state agencies, industry, energy service providers, local communities, and other stakeholders (US EPA, 2003). As explained above, methane is formed in the landfill through a biological/chemical process called Anaerobic Digestion. In the absence of oxygen (i.e. under anaerobic conditions), organic waste is decomposed by bacteria so that a mix of gases result: biogas. Biogas composition (e.g. the percentage of methane per unit of biogas) can vary significantly across locations as this depends on such factors as climatic, industrial and agricultural production characteristics, energy types and usage, and waste management practices. The most important energy services to be addressed by LFG is generation electricity and heat. For example, in the USA, two-thirds of the currently captured LFG is used for the generation of electricity (US EPA, 2003). Electricity generation can take place using a variety of different technologies, including internal combustion engines, (micro)turbines, Stirling engines (external combustion engine), Organic Rankine Cycle engines, and fuel cells. The main part of methane capture takes place via internal combustion (reciprocating) engines or turbines. At smaller landfills, microturbine technology is often used. Some to these technologies (Stirling and Organic Rankine Cycle engines and fuel cells) are still in the development phase. Next to electricity and heat, LFG can also be used for: firing pottery and glass blowing kilns; powering and heating greenhouses; heating water for aquaculture (e.g. fish farming). Globally, without additional measures, methane emissions from municipal solid waste are expected to increase by around 19% above 1990 levels by the year 2050 (US EPA, 2005). This increase could largely take place in developing countries for reasons explained above. Among developing countries, China and India have the highest methane emissions from landfills (US EPA, 2005). 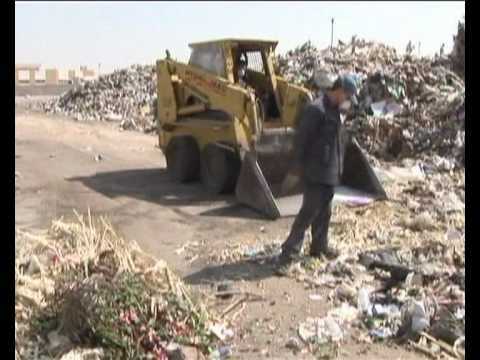 However, commercialisation of waste gas captured from landfills as a source of energy for electricity and heat generation could become an emerging area in several developing countries: LFG, when purified, could replace natural gas and it could be applied as vehicle fuel in the form of compressed natural gas. The Methane to Markets Partnership, launched in 2004 and signed by 19 national governments and more than one hundred private organizations, aims to offer a platform for collaborative working to facilitate methane capture and use projects internationally. In addition, LFG capture projects have been popular investment opportunities under the Clean Development Mechanism (CDM), see below under Climate. In some cases, additional payment by the project sponsor to support community programmes for stakeholders, including support for people living nearby the sites and who are affected by the project (e.g. the sites under the baseline conditions could be considered a source of living for some groups). The process of designing, constructing and operating LFG capture plants creates jobs associated with the design, construction, and operation of energy recovery systems. LFG projects involve engineers, construction firms, equipment vendors, and utilities or end-users of the power produced. Many of these costs are spent locally for drilling, piping, construction, and operational personnel, helping communities to realise economic benefits from increased employment and local sales. By linking communities with innovative ways to deal with their LFG, it helps them enjoy increased environmental protection, better waste management, and responsible community planning. Combustion of LFG for the production of energy contributes to GHG emission reduction in two ways. LFG capture prevents the release of methane into the atmosphere (as a GHG methane is 21 times as powerful as CO2) and the electricity subsequently produced by LFG combustion produces less CO2 emission than conventional fossil fuel combustion. Nonetheless, also energy production from LFG results in CO2 emissions (due to the reaction of methane - CH4 - with oxygen - O2). However, since LFG partly originates from biomass in the landfills, part of this CO2 had already been sequestered earlier in the biomass cycle and will be sequestered again in plants, trees, etc. For calculation of GHG emission reduction of large scale methane capture at landfills project, it is recommended to apply the Approved Consolidated Methodology ACM0001 (Consolidated baseline and monitoring methodology for landfill gas project activities --- Version 11) under the Clean Development Mechanism of the UNFCCC Kyoto Protocol (CDM). This methodology helps to determine a baseline for GHG emissions in the absence of landfill gas capture. In addition, for the part of delivering the electricity production with the captured methane to the grid, greenhouse gas emission reductions can be calculated using the Approved Consolidated Methodology ACM0002 which helps to calculate an average grid-based emission factor in the absence of the landfill gas capture project: Consolidated methodology for grid-connected electricity generation from renewable sources --- Version 11. For an overview of CDM projects in the field of landfill gas capture for power production, see http://cdmpipeline.org/publications/CDMpipeline.xlsx, in the worksheet 'CDM PROJECTS'. In 2005, the World Bank published an assessment of the capital costs of investments in LFG capture for electric power production (World Bank, 2005). One plant assessed was a hypothetical 5-MW (electric) power station in the USA, with the following performance assumptions. For the calculations, it has been assumed that the feedstock would be provided free of charge. However, a provision for royalties to an assumed municipal corporation from the sale of electricity and manure was included under variable costs. This estimation was then refined including future cost projections and uncertainty analysis. Assuming a decrease in equipment cost of 15% by 2015, the exercise resulted in the following investment costs varying between USD 2.5 and USD 3.5 per kWh between 2010 and 2015. Based on this capital cost projection, the electricity generation costs for the plant would vary between USD 0.05 and 0.064 per kWh during the same period of time. These figures provide insight in the financial aspects of LFG capture and use projects, although the order of magnitude of the cost items may be different across countries and between industrialised and developing countries. As explained above, LFG capture and use projects have been established under the CDM, where they generally strongly benefit from the value of the Certified Emissions Reductions to be generated through the projects. For example, the Landfill Gas to Energy Facility project at the Nejapa Landfill Site in El Salvador has presented the following overview of how the internal rate of return of the project changes with on changes in revenues and costs, and the market value of greenhouse gas emission reduction. Netherlands Ministry of Foreign Affairs, 2007. Clean and sustainable? An evaluation of the contribution of the Clean Development Mechanism to sustainable development in host countries, IOB Evaluations, no. 307, the Hague, the Netherlands. US EPA, 2003. User’s Manual Mexico Landfill Gas Model, LMOP, Version 1.0. SEDESOL IIE CONAE. US EPA, 2005. International Non-CO2 Greenhouse Gas Marginal Abatement Report: Draft, Methane and Nitrous Oxide from Non-Agricultural Sources, Washington, D.C., USA. World Bank, 2005. Technical and Economic Assessment: off-grid, mini-grid and grid electrification technologies, Discussion Paper, Energy Unit, Energy and Water Department, The World Bank.